But, as great as the people here are, it was difficult for me to be stuck elevating my foot on a couch while my friends went to Stories of Sustainability, dinner off-campus, and a Mardi Gras party. I pledged and fundraised to dance in a 24-hour Dance Marathon, but the trek was too far to make on crutches. And, of course, I missed my soccer game at Cal Poly San Luis Obispo. Even with the excess time I gained, I couldn’t concentrate on my work because I knew I was missing out and wanted to make it up by spending time with other people. The picture that accompanies this article happened when Rachel, a friend from my hall, saw me slugging through my chemistry problem set at an astonishingly slow rate and requested that I keep her company while she baked rainbow cookies. For the first time in two days, I felt useful. I rely on being busy to keep myself grounded and efficient, and I felt lost in the vast sea of unplanned hours that seemed to stretch endlessly before me. And yet, I still felt like I was missing out, even as I was kneading blue dye into cookie dough and listening to a 2000s summer hits playlist on Pandora with Rachel. When I caught myself wondering what it would be like to dance for 24 hours straight, I asked myself why I was incapable of fully embracing the moment. 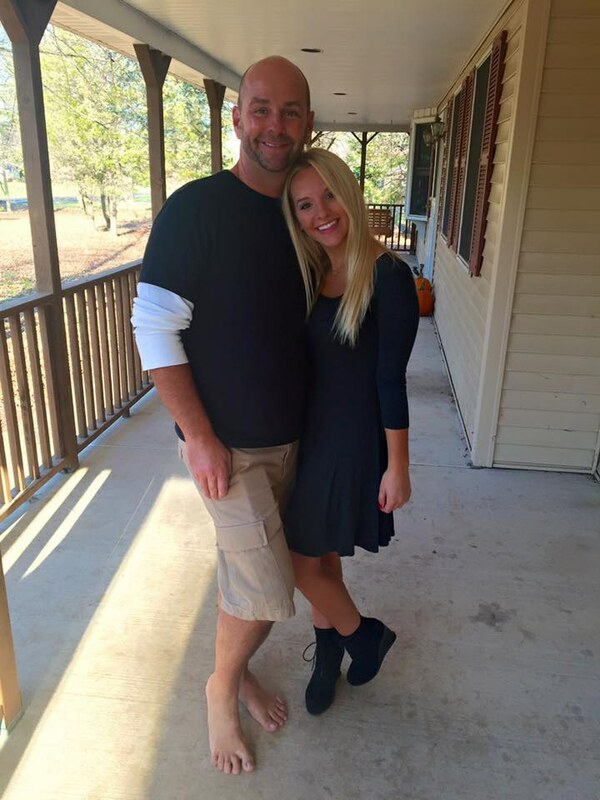 The feeling isn’t unique to this injury; I find myself struggling to truly be present in situations when there are other, equally attractive options occurring. I know I am not the only person experiencing this; I hear the acronym “FOMO,” or “fear of missing out,” tossed around conversations on a daily basis. According to its Wikipedia page, FOMO is “a pervasive apprehension that others might be having rewarding experiences from which one is absent,” a sophisticated way of wording anxiety that an exciting event may be occurring elsewhere. The key words here are might and may; these modal verbs simply suggest possibility, though in the moment they seem definitive. 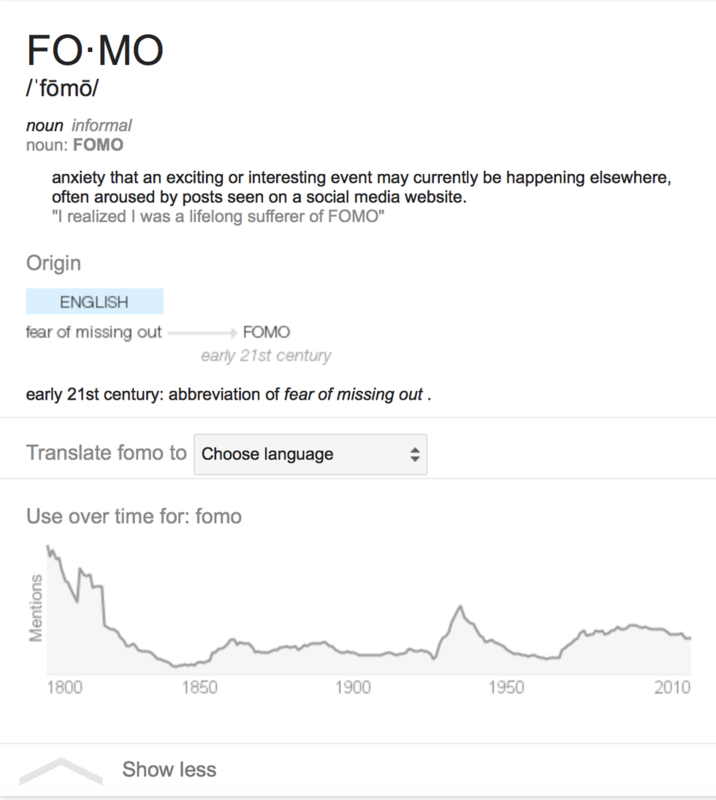 Etymologically speaking, FoMO had an alarmingly high usage around 1800, though a quick search of Google Books suggests “fomo” back then was probably (definitely) defined differently. Numerous online and newspaper articles – and even scientific journal entries – have analyzed the phenomenon. Frequently explained using self-determination theory, the psychological investigation of the acronym suggests “the FoMO phenomenon can be understood as self-regulatory limbo arising from situational or chronic deficits in psychological need satisfactions.” In short, people can choose to adjust their actions to fulfill their desires of competence (usefulness), autonomy (self-freedom), and relatedness (connection with others). This explains why I, and other people, feel antsy in situations when we feel like we’re missing out on other events; knowing that we control our decisions and fearing that we chose incorrectly results in anxious feelings and a longing to be a part of the excitement. After all, some events are unforgettable and beget lifelong memories, and it is often difficult to reconcile missing one such occasion for another one (that is significantly less exhilarating). I have struggled with learning to choose this entire year, and though it was almost freeing to suddenly have my decisions made for me after I injured my ankle, I simultaneously felt more chained. External conditions aside, it is clear that the solution to FOMO is to be grateful for having so many choices, to fully embrace one decision, and to be present in that moment. Yet, despite knowing this, it is still extremely difficult to rid ourselves of those anxious feelings. The quote “Don’t miss all the beautiful colors of the rainbow looking for that pot of gold” rings true, but we will probably continue searching for the gold. There are always more things to do, and many of us will keep choosing to fill our time with as many activities as can fit in a schedule. So, will we overcome FOMO? Some people definitely will, and perhaps it will get easier as time passes. But, for those of us who are unsure, it is important to note that we are not perfect. We will miss out. And that’s okay, because FOMO goes both ways; while it is impossible to be at every exciting event all of the time, it is highly unlikely (while putting in an honest effort) that we will miss out on every single exciting event. Life does not behave like an optimization problem, especially when there are so many variables at play. If we do not accept that we will miss out, then we are setting ourselves up to be unhappy. There are always silver linings, and while some silver linings are shinier than others, they are silver linings nonetheless. This experience didn’t help me overcome FoMO, but I still managed to have fun. Hopefully, I’ll reach a point in my life when I can consistently devote myself to individual moments. But, if not, at least I won’t miss out on everything.